One of the aspects of @mossrockss’ outfit photos that I most appreciate is how comfortable he looks in everything he’s wearing. Of course, he could be fooling me by just being very good at standing in front of a camera, but I’ll choose instead to trust in the truth of the images. I’m not entirely sure how he’d describe his own style, but in my eyes it’s a mix of Ivy and some relaxed Italian basics, a combination favored by well-dressed men and instagram stars worldwide. There are two things he does particularly well. The first, as he himself noted, is pairing blazers with jeans, an example of which you can see here. The second is getting a lot of use out of the pieces he owns. That means that most of the items in his wardrobe are versatile, and easy to mix and match. For example, polos and popovers have been showing up under jackets more and more regularly in Styleforum’s WAYWT threads these days, and for good reason. They look nice on their own, and they add a welcome panache when worn with a sport coat. Especially when they have buttoned cuffs, they can be worn much like any other shirt, or rolled up when your jacket comes off, whether you’re wearing jeans or trousers. Denim doesn’t need any introduction in terms of its versatility, but lately I’ve been particularly drawn to this pair of Orslow ‘Ivy Fit’ jeans, which have a relaxed fit that’s still flattering, as well as an entirely acceptable factory wash. Of course, you don’t have to wear them with a brown blazer – navy and green will work just as well. Finally, it’s @mossrockss’ opinion that canoe mocs go with everything, and while that’s probably not true for me, or necessarily for you, dear reader, I felt I had to include them here. The whole look is a little bit more American than Italian,but I think it’s important to note that Mr. Moss never looks, well, boring – rather, he looks put together in a way that ensures he’ll be well-dressed whether he’s sitting on the porch of a colonial-style house in Massachusetts or in the garden of a Tuscan villa. The chances of you being asked to wear a suit to a beach wedding are, I admit, slim. However, beach weddings do happen, and beyond that, you may find yourself in a setting – a vacation, a dinner at a seaside restaurant – that demands, or at least encourages, a suit on the beach. Of course, this advice will probably work for most informal, warm-weather weddings. Remember, though – always follow the dress code on the wedding invitation to the best of your abilities out of respect for the occasion. Let’s say you do get invited to a beach wedding. First, the smart play is to not wear leather-soled shoes. The problem is that leather shoes are not only hot, but that the salt in the sand (and the sand itself) is not exactly friendly to the longevity of your footwear. However, unless the wedding is actually in the surf zone, you’ll probably want shoes, because sweet mercy does the sand get hot. Unless you want to go barefoot and risk reenacting the end of Terminator 2, or you plan to wear flip flops or Tevas (or my favorite foam Birkenstocks), your best bet is probably a pair of espadrilles. They’re a bit more sand-and-salt capable, and they’re also more summer-friendly in general. The pair above is a rather stunning set of handmade Basque espadrilles from De Bonne Facture, which in this case acquire their gorgeous blue from Dyer’s Woad. Similarly, I would advise against wearing your finest suit to a beach wedding. Not only is there a good chance that you’ll want to roll your trousers up and stand in the waves (which will inevitably splash you much further up the leg/body), but the sea breeze is equally full of salt and sand, which, you know, abrades things. 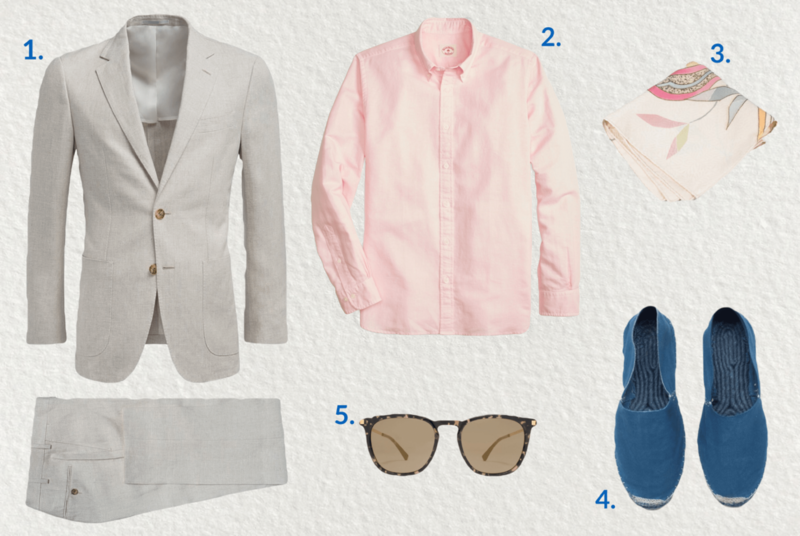 Of course, I’m always a proponent of wearing the clothing you have, but a beach wedding is an opportunity to branch out into something new, by which I mean it’s a good excuse to buy a linen suit. Whether or not SuitSupply is to your taste, they do offer very good value, and this patch pocket number is perfect for post-nuptial daquiris. The relatively low buy-in means you don’t have to worry about spilling slushy umbrella drinks on it, and you can romp in the sand with impunity. Finally, keep things light in color. Not only will you probably appreciate the relief from the heat, but light colors just look nice when they’re sun-washed. I can’t imagine wearing anything but a linen or cotton-linen shirt on the beach, and while a white linen square is appropriate for any wedding, this beautiful abstract floral print from Vanda Fine Clothing deserves to be seen. And that’s it. Or rather, almost. Because you’re definitely going to want two more things: the first is proper eyewear, which means (ideally polarized) sunglasses, because if someone asks you to not wear sunglasses at their beach wedding they’re probably not your friend, and staring a the glare off the waves for an hour is liable to blind you. Second, don’t forget your sunscreen. Oh, and if the happy couple suggests, as I once witnessed from a distance, that they make their way down the sand-aisle to the dulcet tones of Lil Jon’s Turn Down For What, consider steering them in a different direction.